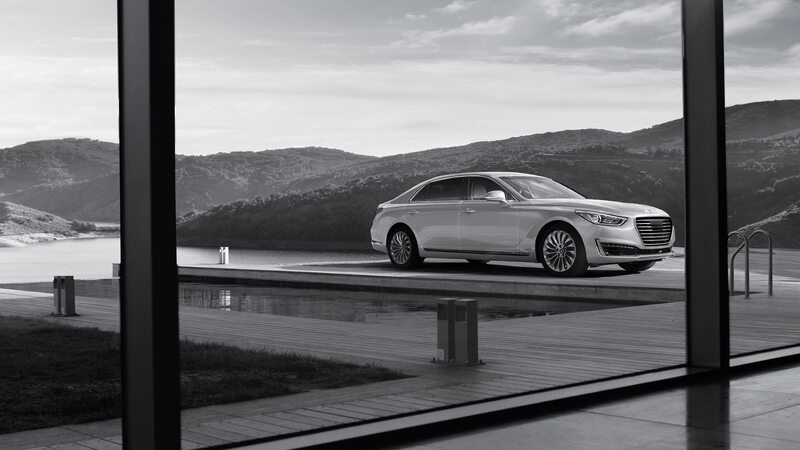 The new luxury brand Genesis has created an entirely new model for 2017: the G90. This top of the line mode offers both drivers and passengers a quiet, comfortable and agile ride every day! Each G90 comes loaded with amazing features from convenience to safety for ultimate customization. 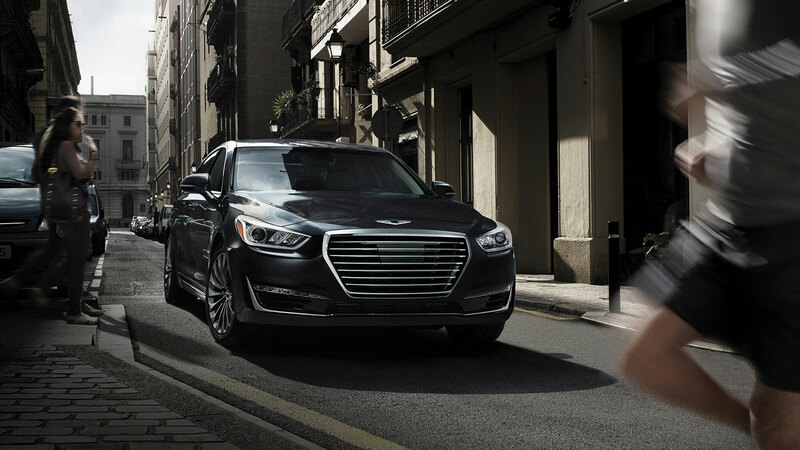 Check out the rest of our 2017 Genesis G90 review to learn more! What kind of features does a 2017 G90 offer? 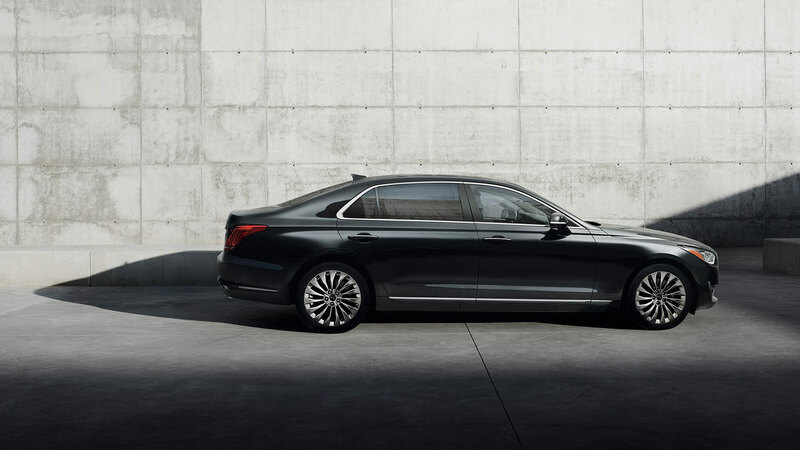 There are two trim levels available for the 2017 Genesis G90. The base 3.3T Premium model comes equipped with keyless entry and ignition, adaptive cruise control, auto-dimming mirrors, an adaptive suspension, a hands-free power trunk lid, power folding and heated mirrors, soft close doors, automatic and adaptive xenon headlights, LED running lights, and 19-inch wheels. 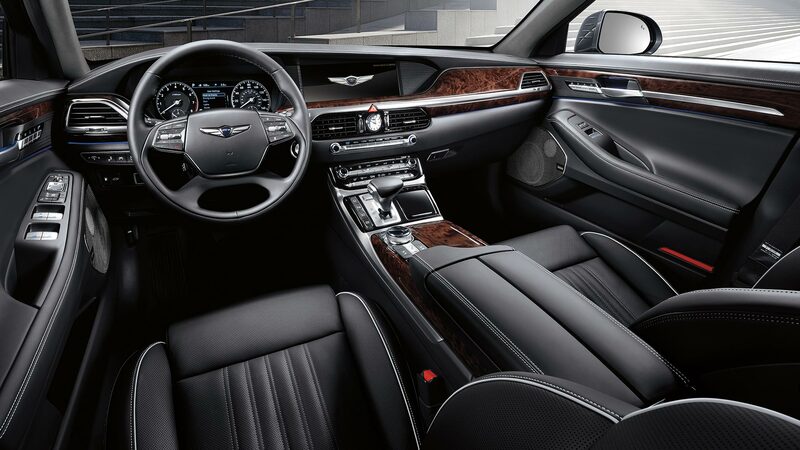 Standard interior features include rear seat audio and climate controls, rear window power sunshades, wood interior trim, adjustable interior ambient lighting, memory functions for the front seats, a faux suede headliner, a power and heated steering wheel, a heads-up display, automatic tri-zone climate control, and heated and ventilated front seats! 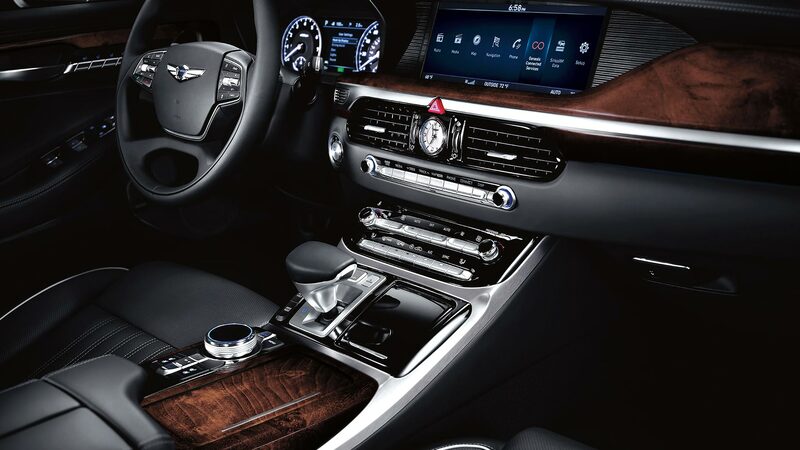 Other standard interior features include front and back USB ports, a Lexicon premium 17-speaker surround-sound system, navigation with real-time traffic and voice controls, a wireless charging pad, Bluetooth audio and phone connectivity, and a 12.3" infotainment screen. The 5.0 Ultimate model gains upgraded rear seats! These seats come with illuminated vanity mirrors, power head restraints, power adjustments, ventilation, and memory functions! Both G90 model trunks open up to 15.7 cubic feet of cargo room for all your stowing needs! 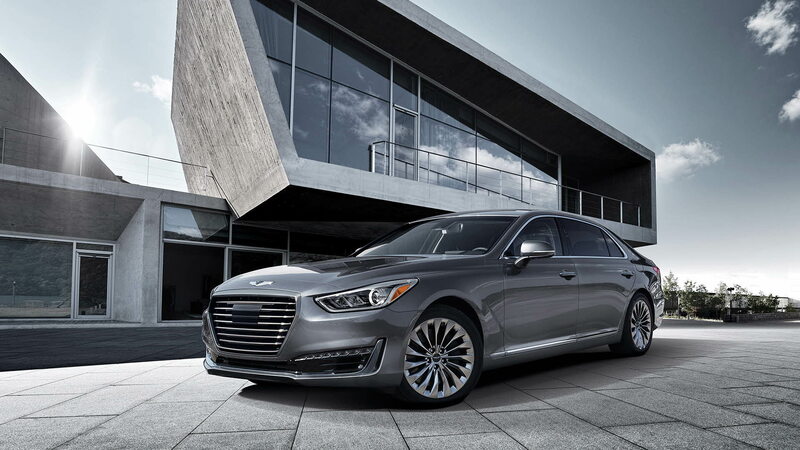 Does the 2017 Genesis G90 offer any engine options? 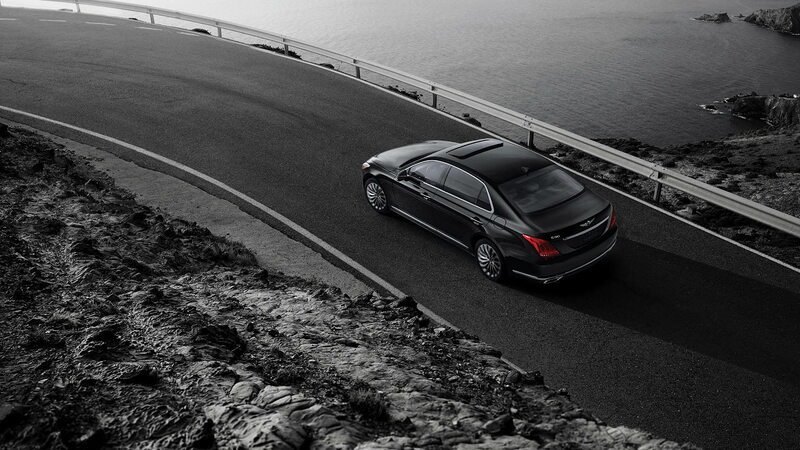 The Genesis G90 offers two engines for the 2017 model year. The base 3.3T Premium model is powered by a 3.3-liter twin-turbocharged V6 engine that delivers 365 horsepower and 376 pound-feet of torque. With both RWD and AWD this engine can get up to 24 mpg on the highway! The 5.0 Ultimate model gets a 5.0-liter V8 engine that generates 420 horsepower and 383 pound-feet of torque. This engine can get 24 mpg on the highway with RWD and 23 mpg with AWD. Both engines come paired with an eight-speed automatic transmission and you have the option of RWD or AWD. Are there any safety and security features for the 2017 Genese G90? 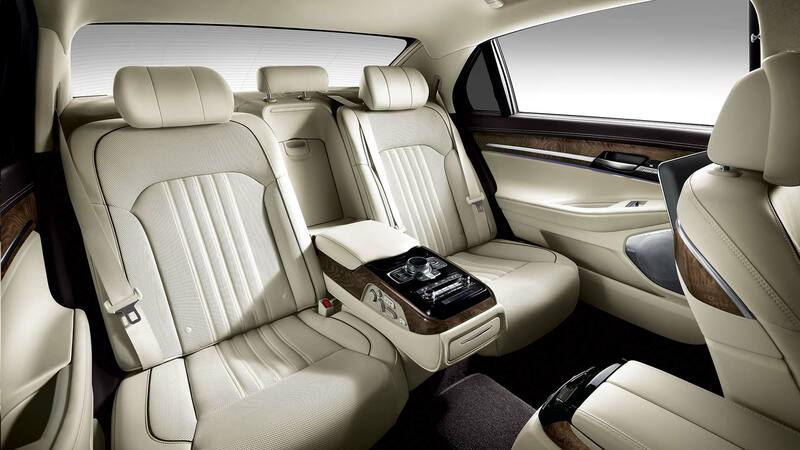 The 2017 Genesis G90's chassis is built with advanced high strength steel and state of the art airbags are installed throughout the sedan to protect passengers in the event of a collision. These airbags can expand the pressure based on the passenger's size and the collisions severity for optimal protection. Both G90 models also come equipped with a haptic steering wheel that can vibrate when alerts are triggered, a drowsy driver monitor, blind-spot monitoring with rear cross traffic alert, a forward collision warning and mitigation system with pedestrian detection, front and rear parking sensors, and a surround-view camera system. The standard Genesis Connected telematics services includes many security features like stolen vehicle recovery/slow down/immobilization, navigation, a vehicle locator, remote door unlocking, remote start, on demand roadside assistance and an SOS button! 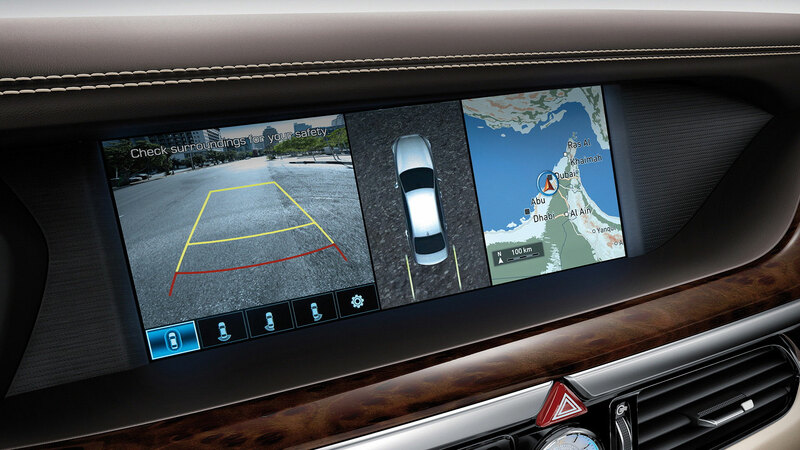 The 2017 Genesis G90 is a fantastic SUV that offers a little bit of everything from safety to technology! Come down to Genesis of North Atlanta today to try out the G90's amazing features and take one out for a spin!